GIF images are gaining popularity among users as they are able to convey great amount of information. So when you are not able to accommodate heavy videos in your projects but want to deliver more accurate visual information, then GIF are useful solutions. Converting a video clip to GIF is the easiest way to make GIFs. If you still feel GIF file is too large, cutting GIF is also a great option. After 28 hours of research and comparison, we rounded up the top 10 video to GIF converters to help you make GIFs with ease. Click the product name to get into the detailed info of each GIF converters. Using interactive platform of Wondershare Filmora, you can easily process all popular video file formats like MKV, WMV, AVI and MP4 etc to develop a classic GIF image as an output. The best part is that Filmora never poses any restriction about file size during conversion hence users can process HD videos to get GIF images. There are impressive editing tools with wide set of attractive features that can make your image highly customized. Feel free to choose advanced elements, animations, text, overlays etc for development of original GIFs. Check this video to learn how to convert video to GIF step by step. The simple and powerful design of Any GIF converter app can immediately turn your favourite videos into interactive GIFs. It supports wide range of file formats like WEBM, ASF, MPG, FLV and AVI etc. The best part is that this tool also allows users to get their media files imported from optical storage devices like DVD etc or even webcam recorded screens can also be processed. It is possible to specify frame rate start and end time markers with ease and for customization, users can access advanced text overlays, loops and resolution effects. Intuitive easy to use interface lets you access it without even checking any user manual. It is simple and completely hassle-free. You may perfect your GIF animation with the help of animation wizard. 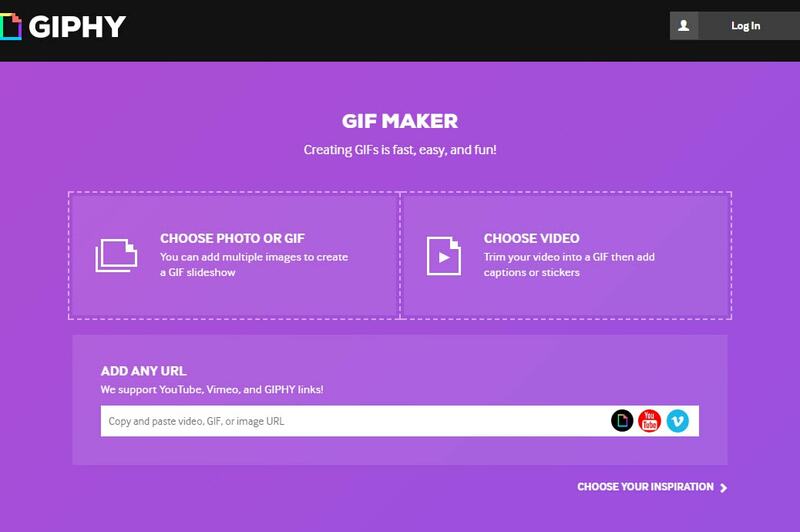 It is an easy and quick way of customizing and adding effects to your GIF animation. You get a built-in image editor that includes a comprehensive set of tools for editing. There are several graphics formats that you may use to convert video to gif on Any GIF Animator. It includes PNG, JPEG, TIFF, BMP, GIF, ICO, PSD, PCX, RLE, PIC, DIB, AVI, PCD, WMF and several others. This lightweight and user friendly application can easily fulfil your video to GIF conversion needs with its straightforward conversion process. Users simply need to upload their video file to software timeline and then update settings for its start time, end time, resolution, frame rate and size etc. 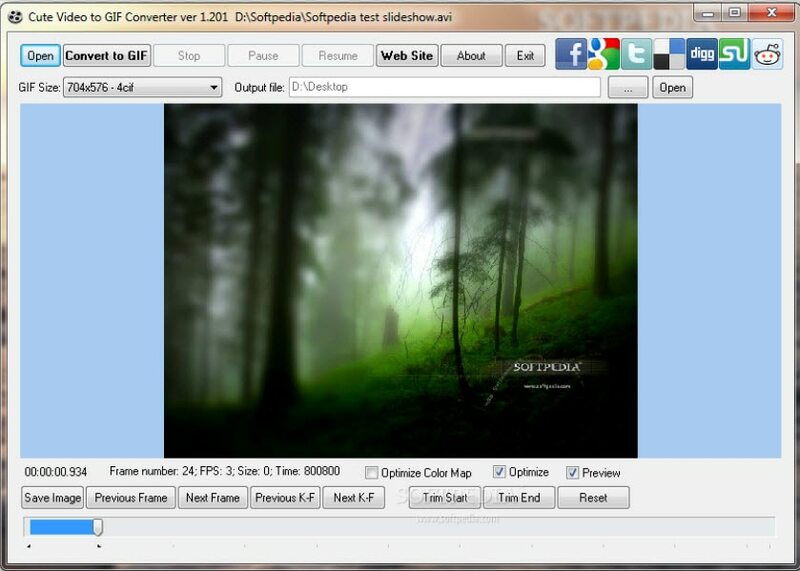 Once all details are specified then simply hit convert button and within few seconds your GIF will be with you. Users can also preview their file at the time of conversion process so that desired changes can be updated on time. A very simple tool that can be easily used by anyone. Allows you to convert long video to gif. The interface has just steps, extract and create a video to gifs. The file types supported are AVI, GIF, mp4, MPEG, and WAV. You can change the height and width of the individual frame. You can select the playback speed. 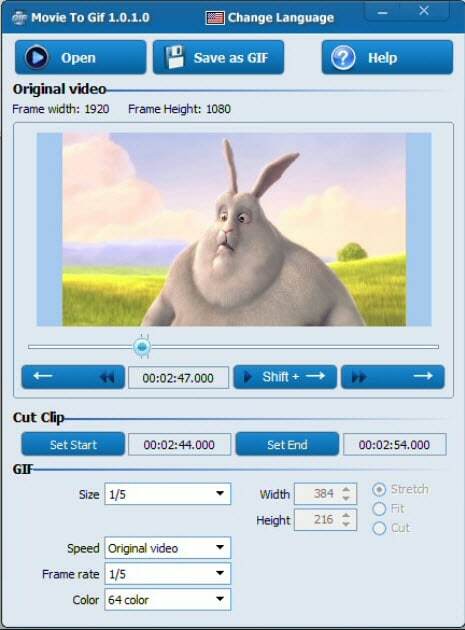 This tool is designed to assist users with fast and efficient GIF conversion processes using various animation effects. It allows users to share collections of GIFS over other networks so that audience can avail best content with ease update. Users can also extract moments from their favourite TV shows and then develop eye catching GIFs with small file size and lesser loading times. It has an intuitive GUI consisting of a single window that shows every segment of the app in one frame with making it fussy. Supports several video file types along with several audio file types as well. The video file types include MP4, AVI, MPEG, RMVB, WMV, VOB, SWF, and M2TS and the audio track formats are MP3, AC3, and WMA. 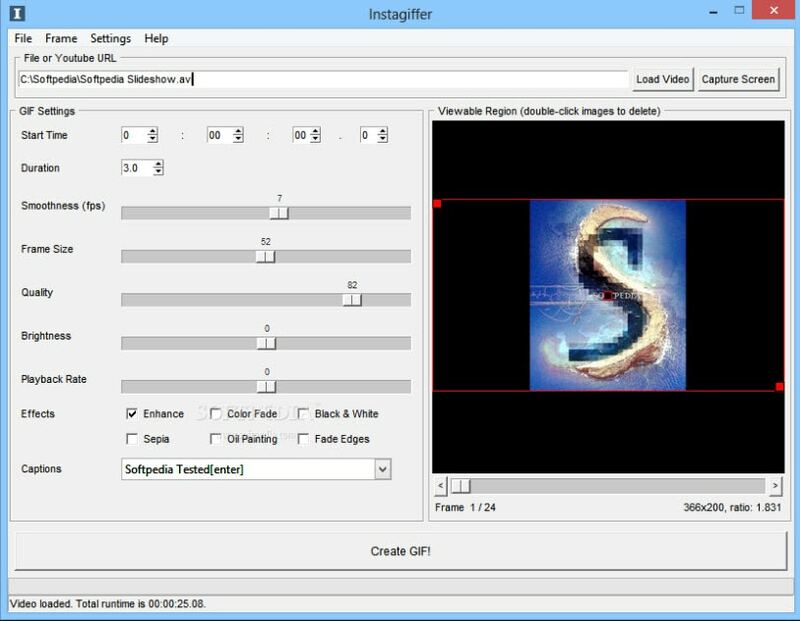 Here is a lightweight yet powerful GIF converter program that can record, create or edit GIF images to produce high quality customized results. Users can easily update various animated clips to this platform with popular file formats like PNG, BMP, JPG, regular GIF and animated GIF etc. Its advanced editor allows easy customization with rotate, trim, stretch, loopback, scale and many more options. Users can easily adjust settings for output file format, size and quality. It is a small, in-built freeware program to convert video to gif. You can import several video MPG, AVI, MP4, ASF, and other video types as well. You can import manifold animated Gif, Jpg, Bmp and Png files. Direct recording of animated GIF images. Allows various editing options like the loop, stretch, pan, reverse, and much more. Converting video clips to GIF becomes very simple with Movie to GIF converter tool because its user friendly interface and fast editing tools make everything possible with ease. 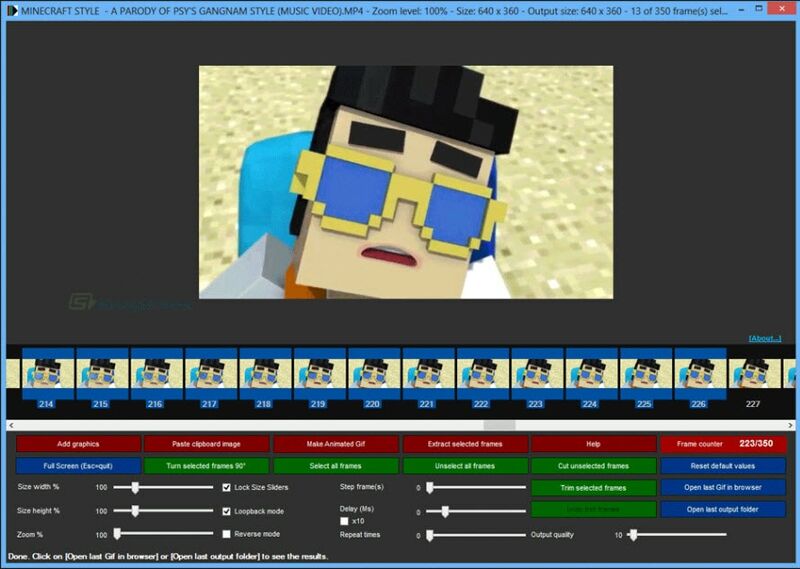 It allows users to define color depth, frame rate, speed and size of videos manually and once all settings are done them GIFs can be created within seconds. This tool supports almost all popular media file formats for GIF processing like VOB, MOV, WMV, MP4, AVI etc. 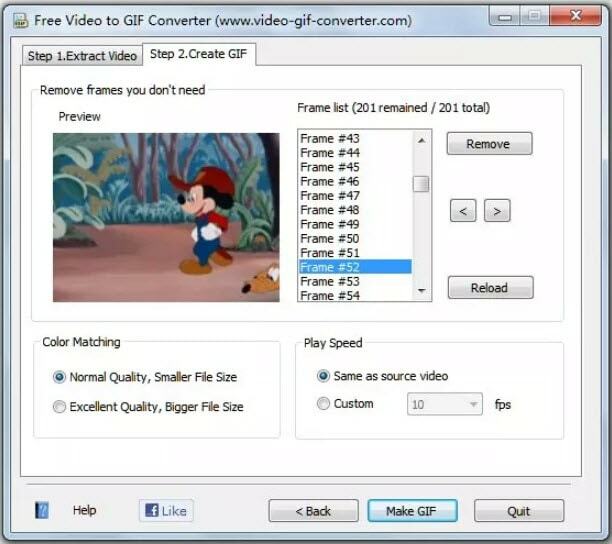 Very simple video to GIF converter. Play video clips in GIF files. Set more frames per second so the output GIF appears as the original video. The breadth and height of the GIF are adjustable. Using Instagriffer, users can collect memorable stills from screen within seconds and then process them interactively to develop GIFs. No matter whether you want to grab moments from your favourite YouTube video, lovable Vine start or something interesting from Netflix, Instagriffer can assist you to import any of your desired moment for designing GIFs. This instant professional image editor tool possesses wide range of loops, filters and text abilities. It is available free of cost and you need not to worry about viruses, spyware or annoying ads on this platform. You can capture the best GIF-worthy moments instantly from your screen. Add text, filters, loops, and more. Convert video to gif completely free of charge. There are two useful options for GIF conversions on Ezgif, the first one is to upload an already existing video file to software timeline for generating GIF as an output. Second option is to paste video URL on specified field in software and then process this video link. It can convert large sized videos into GIFs within very less time. Never forget to use impressive editing tools of Ezgif to get outstanding and professional looking GIF outputs. Convert transparent video (with alpha channel) to transparent GIF. Use resize the crop tool to crop out only part of the video or change your gif’s dimension. Select frame rates as per your requirement. Giphy is well known as biggest GIF supportive platform that is being accessed by millions of users every day. This tool is designed to assists in easy conversions and fast sharing needs for developed GIF images. Users need to copy their desired video URL into specified field on software window and then hit create button. It also follows drag and drop tools for getting videos internally from folders inside computer. Users can also add sound clips for their GIFs and make it more eye catching with additional tags and description. If you need a tool that can process heavy media files faster to develop light weighted GIFS then Zamar is best option for you. It supports more than 1200 media file formats so that users can process any of their desired video or image with ease and their interactive platform makes every editing task much easier with user friendly editing tools. Fast and easy video to gif conversion. Easy drag and drop option for uploading multiple files. High-speed download of the converted files. Here, I am sure you will know which one is the suitable GIF converter for your needs. However, Filmora is a powerful software that can help you create GIFs with straightforward UI interface, and easy-to-use GIF tools. If you want to know the specific steps, please check the video below. "10. Zamar" Zamzar is correct.